This work explores the social foundation of evidence law in a specific historical social and cultural context - the debate concerning the proof of the crime of witchcraft in early modern England. In this period the question of how to prove the crime of witchcraft was the centre of a public debate and even those who strongly believed in the reality of witchcraft had considerable concerns regarding its proof. In a typical witchcraft crime there were no eyewitnesses, and since torture was not a standard measure in English criminal trials, confessions could not be easily obtained. The scarcity of evidence left the fact-finders with a pressing dilemma. On the one hand, using the standard evidentiary methods might have jeopardized any chance of prosecuting and convicting extremely dangerous criminals. On the other hand, lowering the evidentiary standards might have led to the conviction of innocent people. Based on the analysis of 157 primary sources, the book presents a picture of a diverse society whose members tried to influence evidentiary techniques to achieve their distinct goals and to bolster their social standing. In so doing this book further uncovers the interplay between the struggle with the evidentiary dilemma and social characteristics (such as class, position along the centre/periphery axis and the professional affiliation) of the participants in the debate. In particular, attention is focused on the professions of law, clergy and medicine. This book finds clear affinity between the professional affiliation and the evidentiary positions of the participants in the debate, demonstrating how the diverse social players and groups employed evidentiary strategies as a resource, to mobilize their interests. 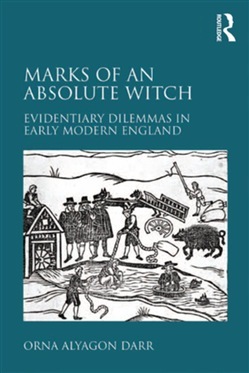 The witchcraft debate took place within the formative era of modern evidence law, and the book highlights the mutual influences between the witch trials and major legal developments. Acquista Marks of an Absolute Witch in Epub: dopo aver letto l’ebook Marks of an Absolute Witch di Orna Alyagon Darr ti invitiamo a lasciarci una Recensione qui sotto: sarà utile agli utenti che non abbiano ancora letto questo libro e che vogliano avere delle opinioni altrui. L’opinione su di un libro è molto soggettiva e per questo leggere eventuali recensioni negative non ci dovrà frenare dall’acquisto, anzi dovrà spingerci ad acquistare il libro in fretta per poter dire la nostra ed eventualmente smentire quanto commentato da altri, contribuendo ad arricchire più possibile i commenti e dare sempre più spunti di confronto al pubblico online.